Influenced by 1960s poolside utopia, Orlebar Brown is a British brand that creates a smart and sophisticated range of tailored resort clothing. The classic ‘Bulldog’ swim shorts are designed to be a ‘short you can swim in’ and can be worn from the beach to the bar. 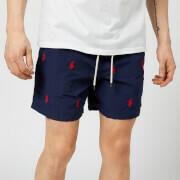 The men’s ‘Bulldog’ swim shorts have a solid navy design with contrasting white stitching. Based on traditional tailored trousers, the shorts are detailed with a shaped waistband, rear darts and signature side-fastener adjusters for an adjustable, tailored fit. 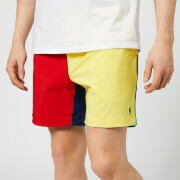 The shorts are crafted from fast-drying fabric and have an internal net lining for increased comfort. Fastened with a snap button closure and zip fly, the swim shorts are complete with side slash pockets, a rear zip pocket and logo-engraved hardware. A branded bag is included for storing the shorts. Orlebar Brown are so confident in the quality of their tailored swim shorts that they will guarantee them for five years.